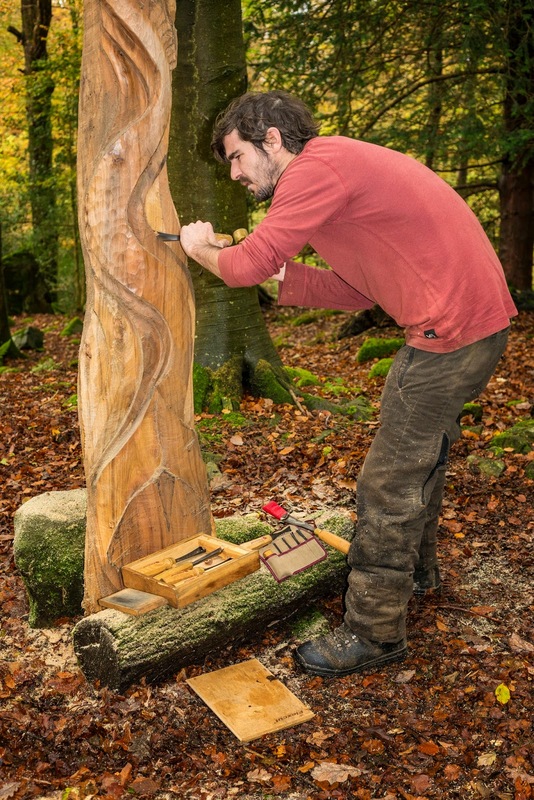 Recently, James Mitchell (Woodland Craft) was requested to create a wood sculpture to evoke the special, distinctive and cherished aspects of the St. Catherine's estate and the Footprint. 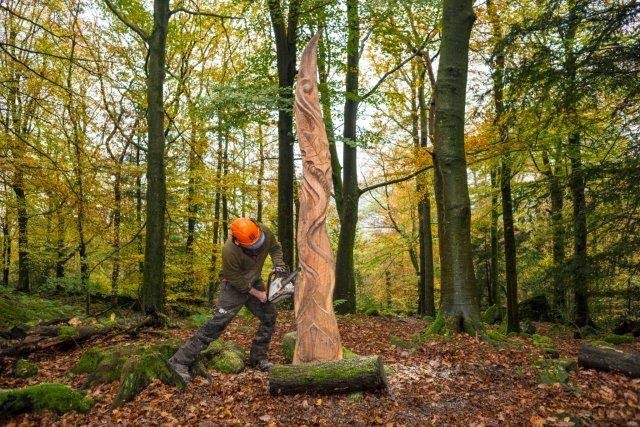 James saw a windblown oak in the woods at St.Catherine's and decided that this would be ideal wood from which to carve a sculpture. Skilful use of a chain saw. 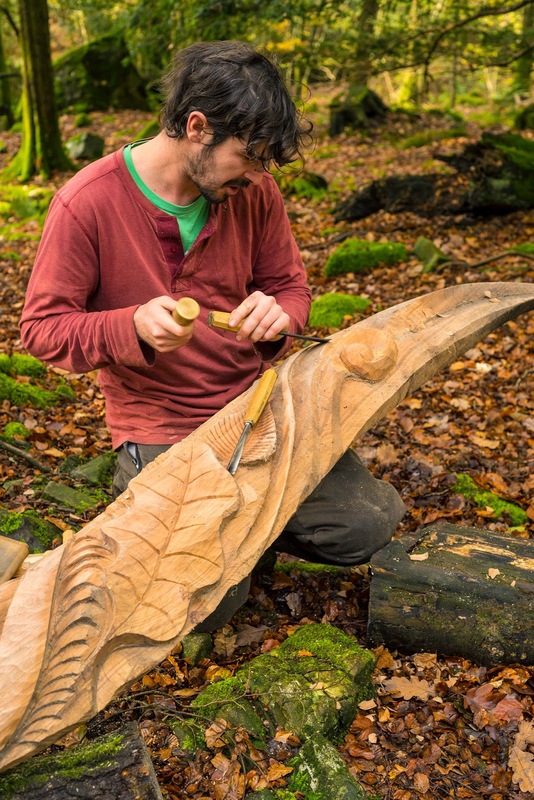 James uses a wood chisel for the more intricate and detailed work. 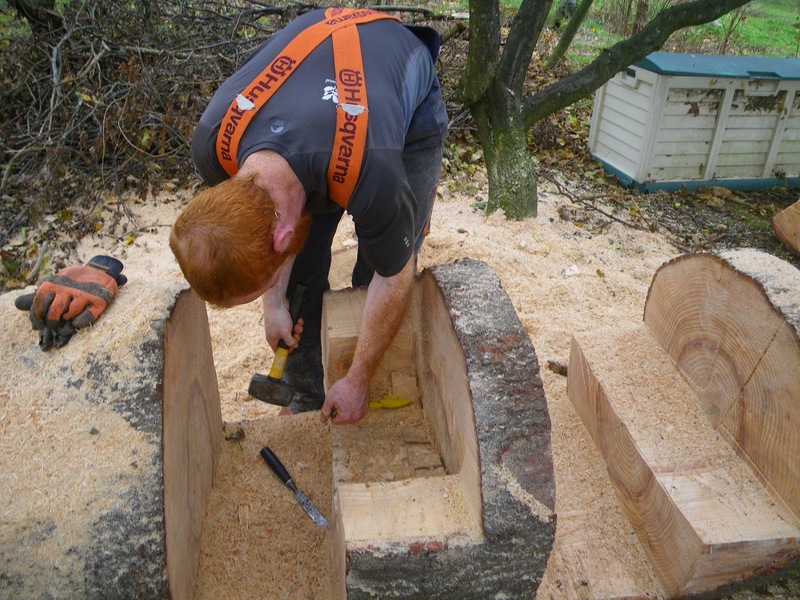 Working in the wood at St. Catherine's close to the site of the fallen oak that provided the wood for the sculpture. The sculpture about to be put in place at the entrance to St Catherine's. A close up view of some of the fine detail work. St.Catherine's is a stronghold of the rare netted carpet moth...occupying pride of place at the base of the sculpture. We are grateful to James who, through his unique sculpture, has encapsulated the distinctive ambience or "Sense of place" that permeates this property and reflects our 'Deepening Connections' initiative. Finally these two images were taken from the sculpture's location on Monday, Jan 19th, after a recent snowfall. Above... The Langdale Pikes, and below...Wetherlam with a glimpse of England's largest lake...Windermere. During last year a number of high winds had blown down some rather large trees in Aira Force. You could almost say some of them were as big as a car!! They were beginning to make the pinetum area look rather untidy. 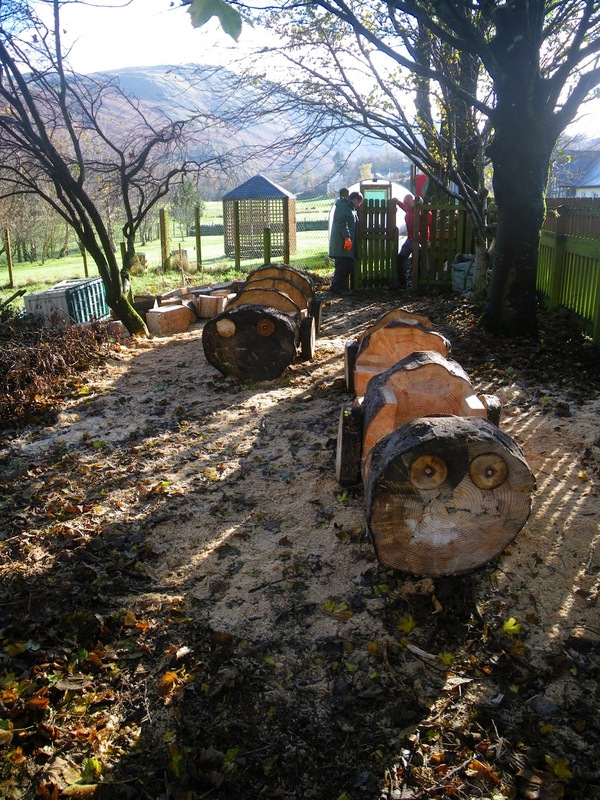 So after a visit by our local primary school from Patterdale, it was decided that they could perhaps use them for something in their outside play area. 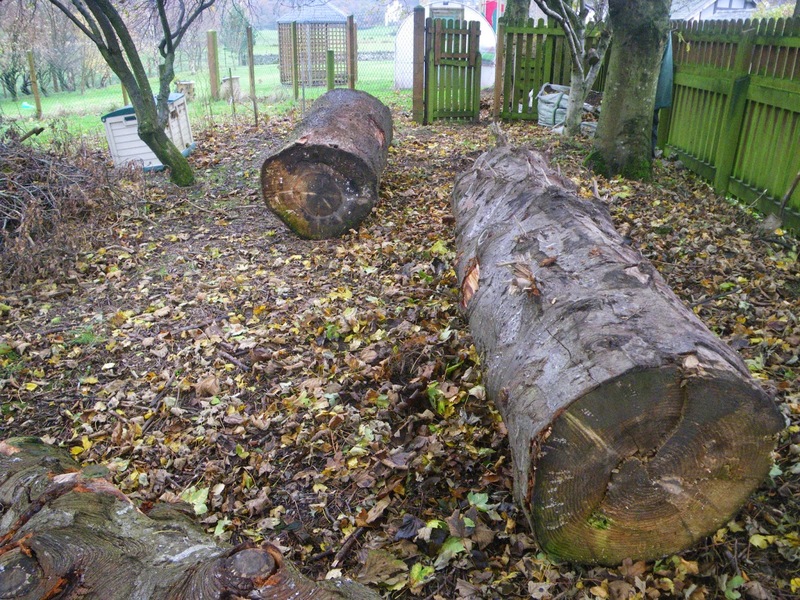 With some help from our forestry team, the three substantial logs where delivered to the primary school. What to do with them now? 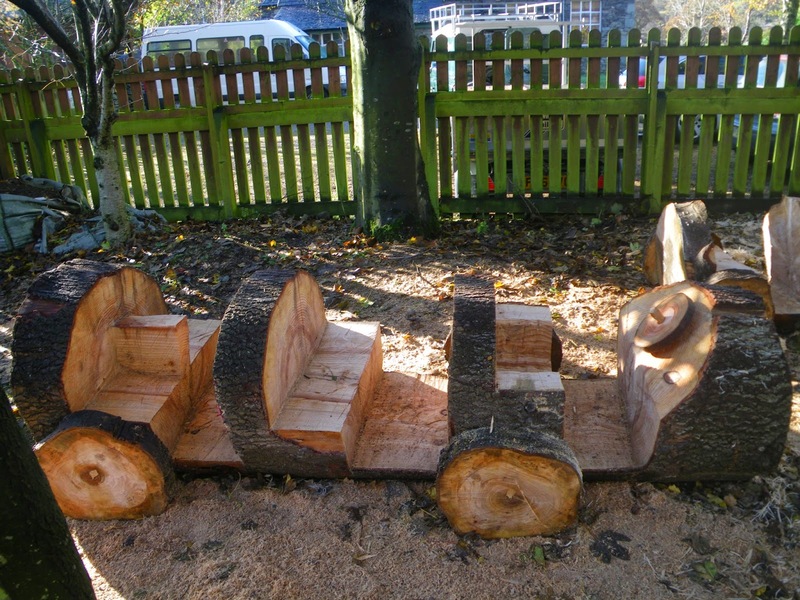 It was decided that two of them would be transformed into log cars for the children to play on, easier said than done. It was time to get in the mind-set of a 7 year old, which to be honest for some of our Rangers this wasn't that hard. The plan was to use a chainsaw to carve out some seating areas. First the outline was marked with the tip of the saw; once all the lines matched up the final cut could be made. 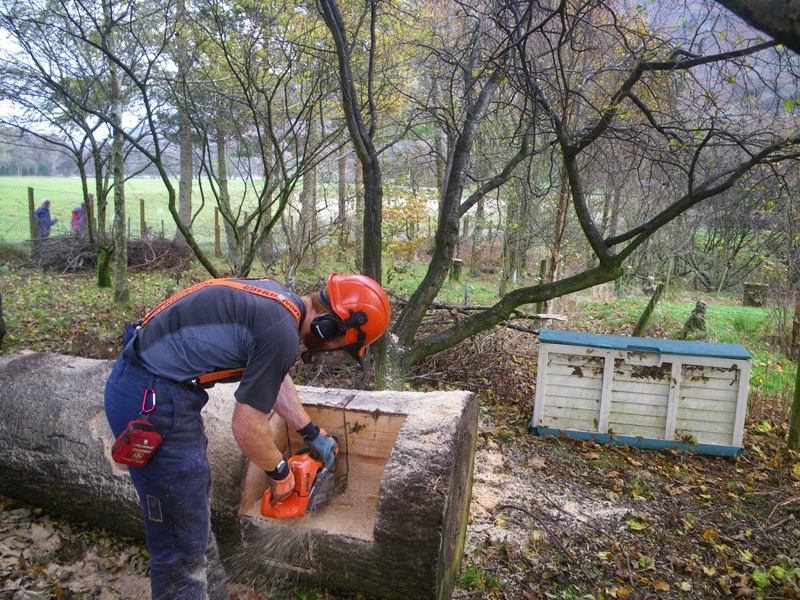 The majority of the work could be done with the chainsaw, but some of the finer details had to be finished off by hand, with a chisel and hammer. A car wouldn't be a car without a steering wheel and wheels. After two days of work the cars where finally complete and ready for the children to enjoy. Strong winds have recently blown several trees down over a woodland boundary wall at St. Catherine's. Although this has added to our work, it presented the opportunity to replenish the fire wood stocks for the Footprint Building that is reliant on a large woodburner stove for heating its interior. Made a mess of the dry stone wall. The wall was repaired once the tree had been cut up and removed. A small windblown ash ready to be cut up for firewood. Loads are brought to the wood store from site by power barrows, once again proving their worth by their ability to negotiate difficult to access, boggy ground. 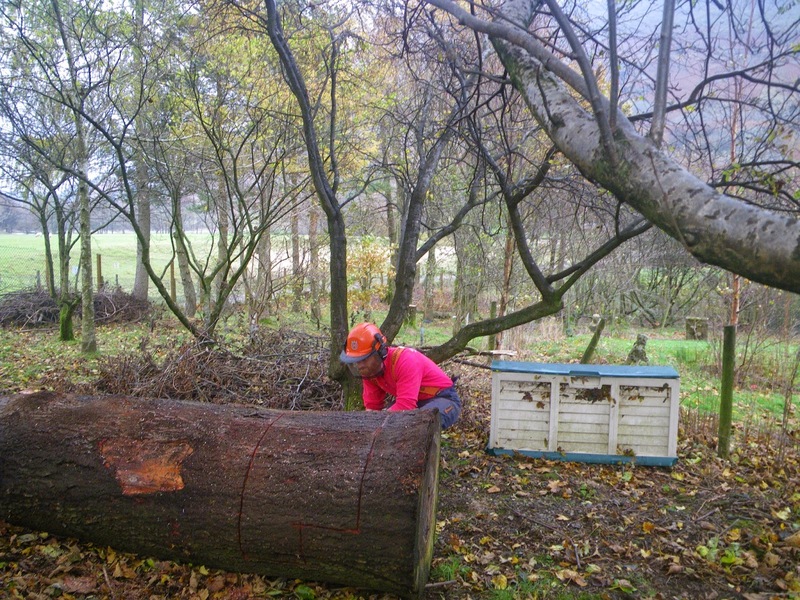 Log splitting, prior to stacking the firewood in the woodstore. There are several compartments in the wood store which allows for the firewood to be used in rotation. The wood in the most recently filled compartment is used last to allow it to "season". A large proportion of the firewood for the Footprint is sourced from windblown trees.